Murphy bed services offers a complete service program, to make sure your bed operates perfectly and is cosmetically up to date. We will fix your Murphy Bed. 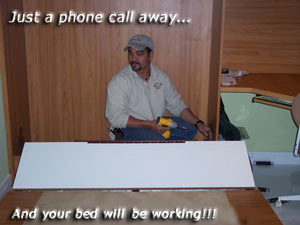 and we will do the repairs necessary to fix your murphy bed. If it needs adjustment we can fix or adjust, align or do repairs to the parts necessary. If your bed needs springs because your murphy bed springs are worn out we have springs in stock. If your murphy bed needs to be realigned our service men can fix that. If something "fell off " we will repair it and put it back together. 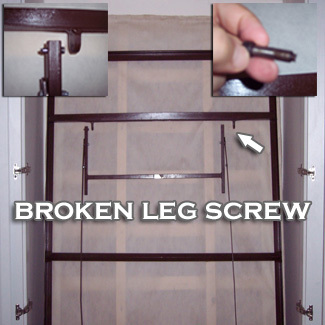 We can repair anything pertaining to a Murphy bed. Murphy bed services specializes in all repair work for your bed to operate correctly, or for it to be cosmetically correct. Murphy bed services can relate to anything wrong with your bed. Do not try to repair your bed murphy bed we recommend you seek the help of a professional installer, service man with murphy bed experience you can trust. F.A.Q l ©Murphybed Services Inc.